There have been reports for a long time about the effects of overchlorination, bacteria and other problems with tap water. Now, where I live, they're finding traces of antidepressants in treated water. But that's not what really has me worried. They've installed a new water tower. Now, the water in the whole neighborhood tastes just a little bit like mud, and when it comes out of the tap, THERE ARE VISIBLE FLAKES IN IT. I've been drinking filtered water from the fridge for years, but most of the time, I get lazy and fill the kettle from the faucet. I'm so creeped out by this new development, I'm getting one of those faucet-filter things this week. But it got me wondering what effect water quality has on brewed tea. There's a debate going on over at Helium where nearly seventy percent of responders say filtered water improves the taste of coffee and tea. 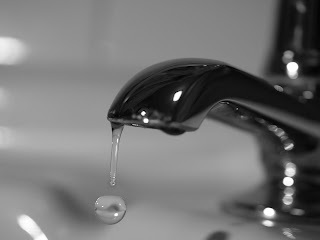 One of the most sensible comments says that the improvement is going to be relative to the quality of your tap water, so if you actually like the taste of your tap water, you may be fine. E-how has a video where they say to use spring, bottled or filtered water -- but not distilled water, because it tastes flat. Several other sites claim that you can make distilled-water tea palatable by adding minerals or brewing it in certain kinds of stone teapots. The other thing intersting thing about using filtered water for tea: bottled/filtered water often lacks the flouride cities add to tap water. Tea leaves, on the other hand contain more flouride than most other plants. So, if you drink a goodly amount of your filtered water as tea, it may just all balance out.